(Listed Buildings and Conservation Areas) Act 1990.
of the AONB and if built on will set an undesirable precedent. There will a detrimental impact on the greenspace when viewed from land and offshore also with loss of established walkway. ​Your objections are still needed before the determination deadline for the case officer and cornwall council to make their decision. The site falls within Falmouth conservation Area & within fields that form a designated open space, managed by Cornwall Council.This land was originally given to people of Falmouth by Earl Kimberley. No buildings are allowed on the site according to terms of the Conveyance. The site is landlocked & can only be accessed via a public footpath or illegally across the fields that is used by the general public for recreational purposes. The fields are part of Falmouth’s green Coastal Corridor and are given High Value status within the emerging Neighbourhood Plan. Any building would be outside of the existing building line & set a precedent for possible creeping development. The construction of a house at this location would be out of keeping with the surrounding land use, which is recreational open space giving an undeveloped green border to Falmouth's beautiful coastline. This border is most important to the character of the seafront, which is hugely enjoyed by both local people and visitors. The proposed development would be a significant visual detraction from the amenity, however well disguised. Cornwall Council's 'The Falmouth and Penryn Town Framework', September 2016, may not be a confirmed policy but is a good guide to planning objectives. 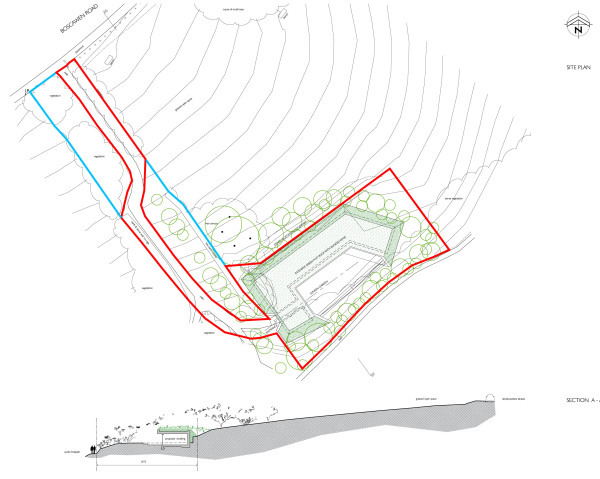 Page 51 of this document shows the application site as part of the Key Strategic Open Space. The draft Falmouth Neighbourhood Plan Policy FOS1 on page 44 gives protection to key open spaces such as this. The site is part of a protected Conservation Area. The high quality visual backdrop to the coast is the reason the surrounding fields were not developed by the former owner many years ago and the same principle applies to the application site. The application plans fail to show the development in relation to public paths and therefore fail to meet the minimum registration requirements of Cornwall Council and national guidance. The applicant acknowledges the coastpath, a National Trail, running to seaward of the site. 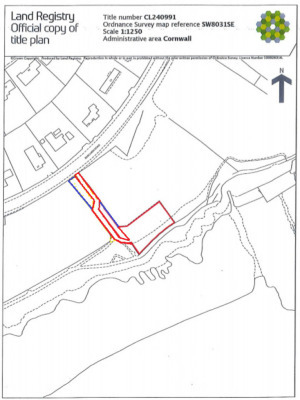 Not mentioned is that the proposed access to the site is along public footpath 18/6 and F7058. This path is very well used by pedestrians but is too narrow for a vehicle to easily pass a pedestrian, particularly if they have a pushchair. It is accepted that the route was the vehicular access to the former sewage tank but this was only very occasional use, not the daily access required for a residential house. For these reasons we strongly object to planning permission being given to this development. To explain the process under which the site achieved its protected status you are invited to refer to the Evidence Base of the Falmouth NDP, which may be accessed online at www.planforfalmouth.info. In particular, reference is made to the Environment and Open Spaces Working Group Report (EOS-WGR), contained in the Evidence Base section. One of the first tasks undertaken by the NDP Stakeholder Group was to gain feedback and opinions from all sectors of the Falmouth community on how the town was viewed and how it should develop. This was addressed by the distribution, collection and feedback of a comprehensive questionnaire, distributed to all residents and stakeholders during the spring of 2015. Over thirteen hundred responses were received. One of the key responses to the questionnaire was the strong desire to protect Falmouth's open green spaces. When asked the question, "What do you think are the most important benefits the Neighbourhood Plan should bring to Falmouth" of the 24 possible answers the one receiving the highest rating was "Protection of local green spaces". To respond to this clear message from the community it was determined that the NDP should address the issue of the protection of Falmouth's green spaces. It was also determined that any recommendations for the protection of green spaces should be informed by a formal, scientific and transparent procedure which assessed their character, importance and value to the community, and the contribution they may make to the future prosperous growth of the town. 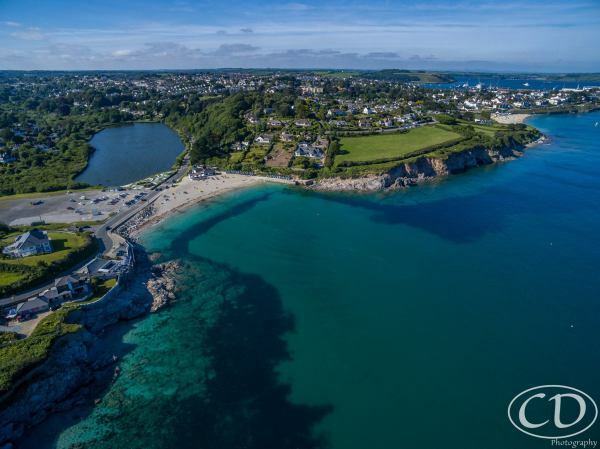 Cornwall Council's Natural Environment Department was engaged to develop a methodology and process for assessing the landscape character of Falmouth's open spaces. This resulted in the design of an assessment protocol based on methodologies and criteria outlined in the Cornwall Landscape Character Assessment study conducted in 2007 (Doc ref. 11 in appendix 2 of EOS-WGR). The protocol was adopted as the Falmouth Local Landscape Character Assessment (LLCA) and was used to assess one hundred and forty three (143) open space sites in Falmouth. The sites selected for inclusion in the LLCA programme were those defined by Cornwall Council in their open space strategy document (Doc ref. 10 in appendix 2 of EOS-WGR) supplemented by sites selected as strategically important against a defined set of criteria. The site which is the subject of PA17/02387 is an integral element of the amenity area known as Boscawen Fields; it was included in the LLCA programme as a distinct separate entity . The result of the study was to award the site a "High" value rating. (The procedure outlining the process of assessment is detailed in section 5.5 of EOS-WGR). Cornwall Council's Natural Environment Department was again consulted in the development of suitable policies to make comment and judgement on the assessed sites. 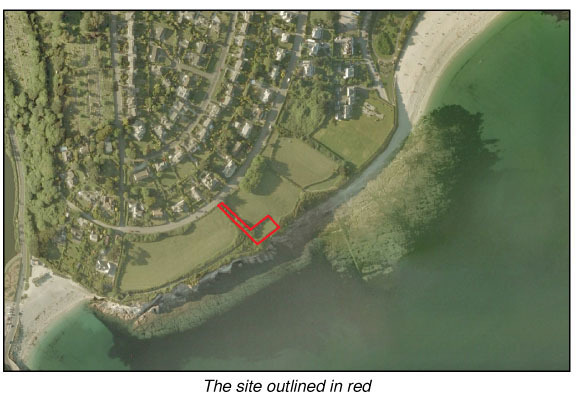 In relation to the site in question, assessed as High Value, the relevant policy was entitled, FSO.1 Protection of key open spaces, which states, "Development which would result in either the loss of or harm to the character, setting, accessibility and general quality and appearance of any open spaces recorded as having a moderate or high value from the Falmouth Local Landscape Assessment will not be supported". 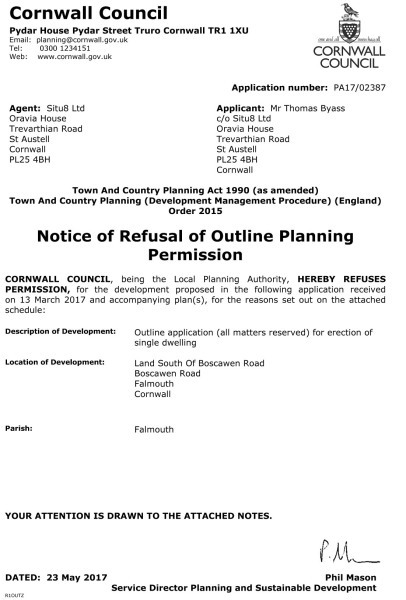 With regard to the weight to be given to the Falmouth NDP as a material consideration, the useful note on the CC Website (https://www.cornwall.gov.uk/media/12360769/Briefing-Note-weight-of-emerging-neighbourhood-plans.pdf) advises that, where an NDP has reached the pre-submission consultation stage (R14), 'Some weight could be given to aspects where clear community support can be demonstrated. The decision maker will have to assess the quality of consultation, level of support and the general conformity of proposed policies.' It can be confirmed that "clear community support" is adequately demonstrated in the summary report on the R14 consultation process, which states, "The strongest support is for the Environment and Open Space proposals." It should also be noted that Cornwall Council has recently announced it has reviewed its Open Spaces Strategy for Larger Towns in Cornwall document and modified it to accommodate information and proposals contained in the Environment and Open spaces Working Group Report (EOS-WGR) cited above. The Cornwall Council open spaces document is being forwarded as a Supplementary Planning Document.